A Fantasy Romance Series for Adults that is Percy Jackson all grown-up and a mixture of Vikings meets Trueblood! "Dramatic, Lustful, and fantasy fulfilling." Tiffany, TiDa Publishing. Known for hunting the supernatural, no mortal man realizes Lord Cedric is one of Sorceress Morrighan’s abominations. After competing in a tournament, he is wed to a Lady of the Court, Angeline. Cedric’s senses begin to overwhelm him and he struggles to decipher his feelings; Are they a creation of his incubine bloodline or truly heartfelt emotions for the girl who has lost it all to him? He finds himself forced to choose between falling in love or continuing his suicidal quest to kill his creator. Epic battles against all manners of beasts and demons fill this story with memorable antagonists such as Morrighan and her two sisters; Romasanta the Father of Werewolves; Succubus Queen Lillith and many more. Find yourself engulfed in lores and history long forgotten from the 12th Century and beyond. Valerie Willis is a sixth generation Floridian who loves crafting novels with elements inspired by Mythology, Superstitions, Legends, Folklore, Fairy Tales and even history. In 2018, she received the Reader’s Favorite Bronze medal in Fiction – Mythology and FAPA’s President’s Silver medal in Fantasy/Sci-fi. She braved the Independent Publish route at the end of 2012 and has devoted herself for being a pillar of “Self-Publishing How-to” from formatting of both print and digital versions to book cover designs. 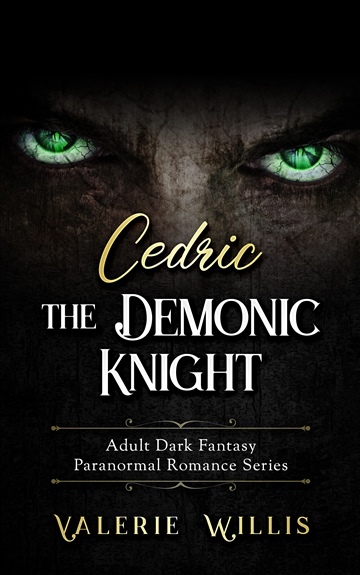 Her fantasy romance novels within the Award-Winning Cedric Series is a wonderful blend of genres that appeal to a wide-range of readers whether they like paranormal, fantasy, romance or action adventure. The characters are flawed in mental and emotional ways while being amazing powerful creatures, demons, witches and Gods. Many of the monsters presented in battle derive from Medieval Bestiaries and adds a fun flavor of new yet deeply rooted assortment of creatures such as Coin Iotair, Shag Foal, Cynocephali, and many more. For Young Adult readers looking for a Dark Fantasy and coming-of-age lessons, Tattooed Angels Trilogy is an ode to her teenage life for those teenagers getting ready to step out in the world on their own. Hotan is a failed reincarnation and is becoming immortal against his will. Life is complicated and often we withdraw within ourselves, shut others out, when life becomes hard. As the story unfolds we learn the importance of opening up and asking for support in all its forms to the people in our lives even beyond friends and family. Each immortal controls amazing powers of Nature, like fire, or elements of Humanity, such as fear. You can often find this Author hosting workshops about writing and self-publishing in the Orlando, Florida area or working on the next novel. She loves to inspire other writers and creative minds. Be sure to visit her blog for some of the advice she has to offer from a perspective that has influences from Game Development and Graphic Design. Cassie May rated it 5 out of 5 "it was amazing"
Wow. Just wow. This book is awesome! Like, it kidnaps you in a world full of darkness, blood and war and yet you don't want to leave. It starts innocently and you think, oh my, this Cedric guy is a real douchebag, but then, slowly so slowly, you come to realize that there's a reason for his douchebaggery and this reason breaks your heart. I cried for him. So much. His despair, it was... Like not from this world. The punishments he took upon him were awful and too much for one person to carry. He was one of those heroes you get to know like an onion: Layer after layer while crying more and more with each layer. I was astonished at how hard he worked to redeem himself and I wanted so much for him to get his Happily Ever After. I didn't think it would be possible, not after everything he told the bartender and then the thing with the finger. It was so sad. His heartbreak was so real for me. I shed so many tears. And I am still not completely over this book. This book is for you, if you are interested in folklore, old tales, magic, darkness and historical stuff as well as heartbreak and redemption. Shortly said: This book contains something for everyone. I loved everything that was mentioned in the book. The different creatures, the goddesses and gods, the feelings these things had even though they shouldn't be able to feel anything (this is for you, Morrighan!) and, of course, the conclusion. I really liked how Merlin was portrayed, since most books paint him in a rather positive light and I really enjoyed him getting the darkness this time. I give 4.5 wonderfully deserved stars for this book, because I would have liked the end to be a bit slower, but this is just my personal preference. I really really enjoyed reading this book and am looking forward to reading more about all the creatures in further books.